On a brighter note, WebMD.com reviews another study (this one from The European Heart Journal), which suggests breaks from sitting may also reduce ‘inflammatory processes that can play a role in the blocking of arteries.’ The key here is movement – a combination throughout the day of sitting and standing can be beneficial to just about everyone! 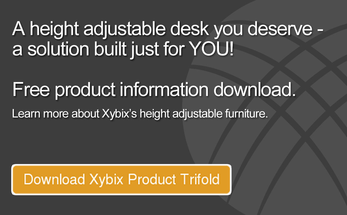 Enter the height adjustable desk - within recent years, an innovative addition to workplace furniture has taken hold. Although type of technology is relatively versed in the 911 industry and other 24/7 high intensity usage markets, it hasn’t been until recent years that the concept has emerged in the general office setting. Now, call centers, security and even companies such as Google and Facebook and even classrooms from elementary to University level are starting to use this technology. 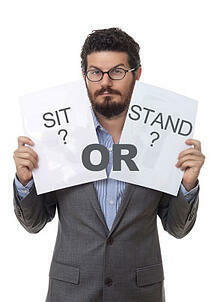 Who Should Consider a Height Adjustable Desk? Look at it this way, the average American could probably "stand" to reduce their chance of diabetes, heart problems and stroke. Although a little dramatic, it's true, just about any occupation that has you seated for an extended period of the day could shorten your life, regardless of how active you are after clocking out. As USA Today noted in its article The Longer You Sit, the Shorter Your Life, sitting around is a favorite American pastime. Height adjustable desks, often called ‘sit-stand’ or ‘sit-to-stand’ desks, have traditionally been geared more toward workers who use their desks for extended periods of time, such as 911 dispatchers, radiologists, security personnel monitoring cameras and call center employees. Although, Bloomberg Business Week notes that the average American worker holds a sitting position ‘for an average of 8.9 hours a day.’ So, logic would dictate that a height adjustable desk could and should be used for just about any 21st century employee. What are the Health Benefits? Most fixed-height desks hover somewhere between 27 and 30 inches above the floor. Holding a sitting position for any length of time means that blood pools can form in the large muscle groups such as your thighs. A graphic at LifeHacker.com shows that also possible is lessened electrical activity to the legs; reduced calorific burn; a markdown in the activity of enzymes which help burn fat; even a plummeting in ‘good cholesterol’. Adjusting the height of your desk from a sitting position to a standing position will increase blood flow and circulation, so your muscles will be more nourished. Musculoskeletal pain, particularly in the back and neck, may also be reduced. The advantages to working at a height adjustable desk are mental as well as physical. Users are able to concentrate better, for longer, stay focused more easily, and mood levels are improved. Still not convinced? Maybe your boss isn’t either. Well, here’s a great tidbit, workers who have an adjustable height desk take fewer breaks, thus are more productive. In addition, measurable improvements in concentration and work output have been seen. How It Works. Height adjustable desks are typically more costly than fixed height desks and usually operate with the use of electronic lift columns. A simple button-press effortlessly lifts the desk from its sitting configuration to standing, or can be halted at any midpoint, allowing users of various sizes to adjust their workstation accordingly. All this is done without any effort on the part of the user. Height adjustable desks are most commonly available in single (pedestal), double and three-legged designs (depending on surface size and shape). Most top-end suppliers offer both single and dual surface options with independent height adjustability. So, if you are in the market for a height adjustable workstation, be sure to check the weight the desk can bear as well as the lifting capacity for your particular equipment and size. Some manufacturers offer accessories such as file cabinet and storage compartments to complete the overall look. A Look Into the Future. The future no doubt holds a wave of add-ons aimed at the users of a height adjustable desk, perhaps including integral treadmills, static exercise bikes and exercise ball chairs. Maximizing the opportunity to adjust between sitting, standing and movement will increase your overall health, energy and happiness.